Who said pillow fights were only for kids? We have had pillow fights as kids with our siblings and with friends at sleepovers. This time it was with complete strangers from 1500 to 1530 at Trafalgar Square in London. 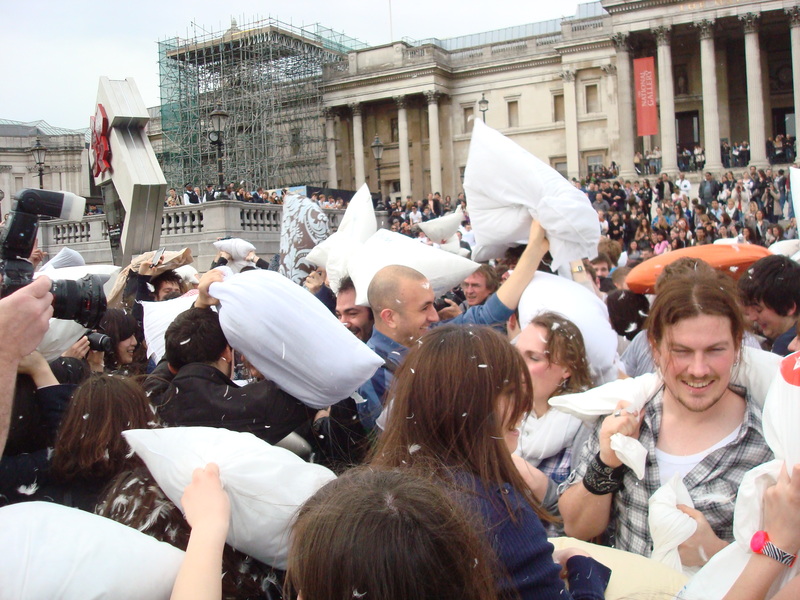 The International Pillow Fight Day is celebrated on 2nd April all over the world. The pillow fight is part of the urban playgroup movement – a playful part of the larger public space movement. The International Pillow Fight Day was started in 2008 by University of Toronto students Kevin Bracken and Lori Kufner. The International Pillow Fight 2011 was held in 130 locations over the world including Adelaide in Australia, Toronto in Canada, Zurich in Switzerland, Seoul in South Korea, Paris in France and others. Don’t take permission to hold the event. Public assembly is a human right. The International Pillow Fight Day 2011 raised money through the sale of memorabilia towards the Japan Tsunami Appeal by the British Red Cross Foundation. Memorabilia included the ‘whack and keep’ souvenir pillows for £5, t-shirts for £10.50 and tickets for the after party. Trafalgar Square was full of people in their nightgowns, jumpsuits, overalls, onesies, fluffy slippers, bathrobes, long john’s and pyjamas. The whistle blew at 1500 and people of all ages started swinging their pillows. As they were fighting, many pillows exploded and there were innumerable feathers flying all over the place. I was totally trashed and full of feathers but my pillow was intact. At the end of the fight, many were exhausted and laid down at Trafalgar Square with their heads on their pillows. Very great post. I simply stumbled upon your blog and wished to say that I have really loved surfing around your weblog posts. After all I will be subscribing in your rss feed and I am hoping you write again very soon!